Our primary classroom is designed to meet the needs of the rapidly developing 3-5 year old. 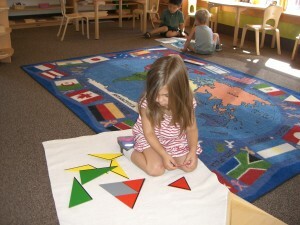 Classes are composed of mixed-age groups to allow for cognitive stimulation while also meeting each child’s social needs. The purpose of this program is to enrich and promote the further development of each child’s natural curiosity and zest for learning. Each class has a wide variety of materials for hands-on exploration and trained staff that facilitate a child’s trust in him/herself through risk-taking, further questioning and skill development. Our students pursue their quest to learn through experimentation in the many facets of life: Care of Self and Environment, Language, Mathematics, Science, Music, Art, Geography and History. Our curriculum provides basic knowledge as well as integration with real-life experiences and is implemented with respect to varying learning styles and natural human development. The flow of the classroom is hard to miss. A child must be at least three years old and toilet-trained to enroll in this program.